Garden recliner chairs are a must for garden lounging, and there’s nothing better than taking a nap in the sun at the weekend before firing up the barbie and enjoying a few cold beers. Here we’ve rounded up some of the best garden recliners currently on the market that are both stylish and comfortable for your lazy summer days. Need more advice? Find out how to choose garden furniture and consult our sourcebook of top garden suppliers for even more options. When considering which garden recliners are best for you, material is a big factor. 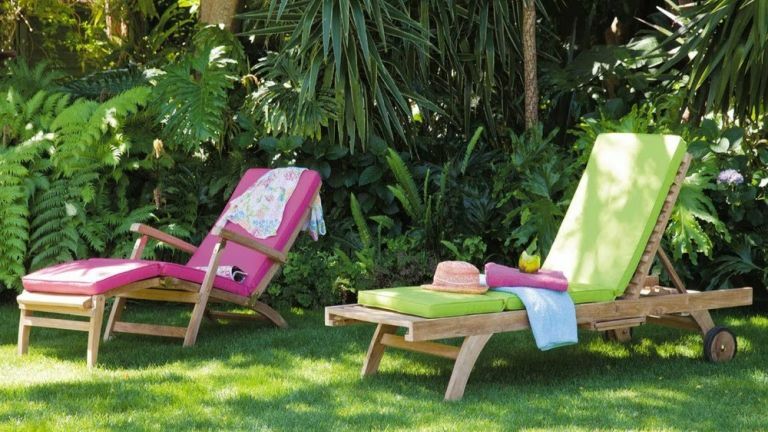 If you go for wooden garden recliners, such as the John Lewis Venice 'Steamer' Sunlounger, then remember that these look stylish but do require some upkeep. You’ll need to stain them every summer to ensure they keep their new, pristine finish; otherwise the wood will fade and deteriorate over time. Metal recliner chairs such as the Monaco St Grey Pair of Zero Gravity Loungers don’t require as much maintenance but will need to be covered over or stored away when not in use to ensure they don’t rust. You may also want to consider if your recliner comes with cushions, as this will be something else you need to factor into your budget if not. Check out the full list below for some garden inspiration. This classic wooden sunlounger is perfect for anyone wanting to relax in their back garden this summer. With five reclining positions and a cushion included, you can find the best positioning to soak up the rays all afternoon. It folds away so it’s easy to store and carry, and the robust frame can take a maximum weight of 20 stone. It is however, a little small for anyone over 6ft, but those who have this recliner find it to be very comfortable and sturdy and also say it weathers well so you won’t have too much upkeep either. This set of two metal garden recliner chairs is lightweight and easy to position for the perfect sunbathing angle. They fold away neatly, making them easy to store in a shed or garage so they do not rust. These recliners also have integrated seating pads and head rests for the most comfortable recline and they come with a handy drinks' holder and well for your phone; the ultimate luxury garden recliner. Shop more garden recliners and sun loungers at Dunelm. If you’re out in the garden every chance you get, then this garden recliner is a great design to have. The frame and fabric are UV resistant, anti-fungal and tear resistant, so you can expect this lounger to last very well. It’s fully adjustable with a removable headrest and it is also easy to maintain and wipe clean. Users say it is reasonably lightweight so it can also be taken on days out to the beach and it is said to be smooth and easy to collapse and recline at your leisure. For the ultimate luxury day in the sun, these double garden recliner chairs with a sun roof are the way to go. There’s room for two of you to relax in the sun with four different backrest positions and then you can also place the sunroof overhead if you need a bit of shade throughout the day. These garden recliner chairs do require some assembly and the canopy will need to be removed during bad weather to avoid poles snapping. Customers found this sun lounger set to be very comfortable and great for putting your feet up. All textile covers are also machine washable making it easy to clean and maintain. This sun lounger is already set in a recline position and is on a rocking base which makes for a comfy position to rest in. With armrests and a head cushion, you can expect to easily drift off in this floating recliner very easily. Reviewers found this chair easy to assemble and fully supportive when in use but say that the rocking mechanism isn’t for everyone.